This entry was posted in Sports on February 6, 2019 .
were presented at a provincial Special Olympics gala in Halifax recently. 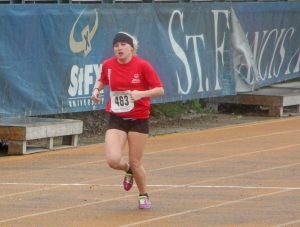 Track and Field athlete Sasha Repko of Port Hawkesbury is Special Olympics Nova Scotia’s Female Athlete of the Year. Swimmer Evan Sharpe of Stellarton is the Male Athlete of the Year. Angus MacGillivray of Antigonish won the Frank Hayden Award, presented to an athlete who has shown long time dedication and commitment to Special Olympics. MacGillivray has competed in track and field, cross country skiing, soccer and floor hockey. Cathy MacDonald of Antigonish has been named volunteer of the year.